Approximately 20.5 x 15cm. 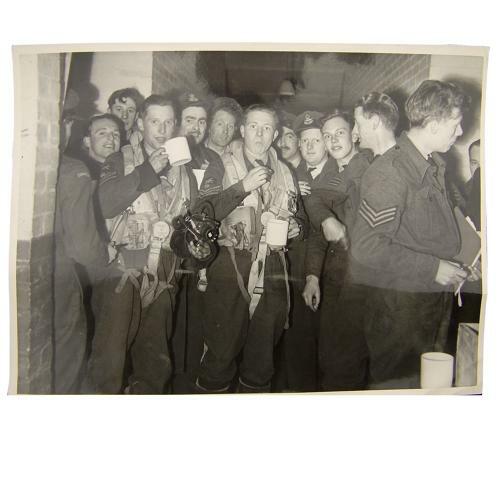 Excellent evocative image of aircrew enjoying tea following a raid. The two men at the centre are wearing war service dress uniforms, 1941 pattern Mae Wests and Observer parachute harnesses. The chap left of centre is holding an internally wired C-type flying helmet with G-type oxygen mask and hose plus a pair of Mk.II goggles. Fox photos Ltd. stamp on the reverse. Minor creasing but in very good overall condition. Stock code P22873-112.